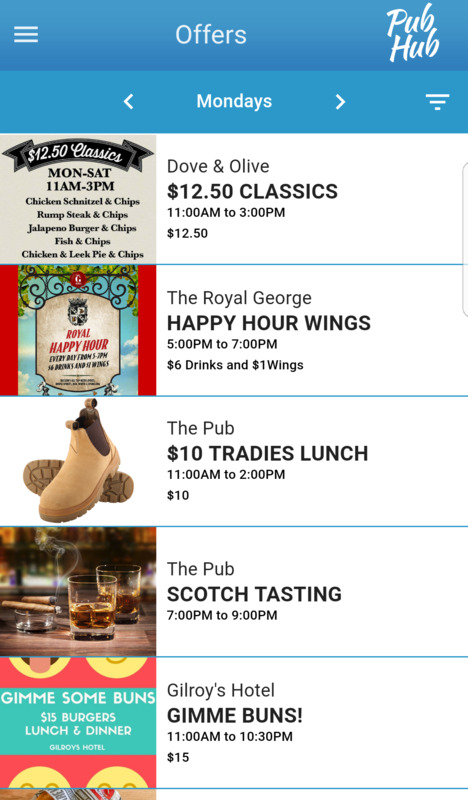 Find the best deals at pubs in your area! 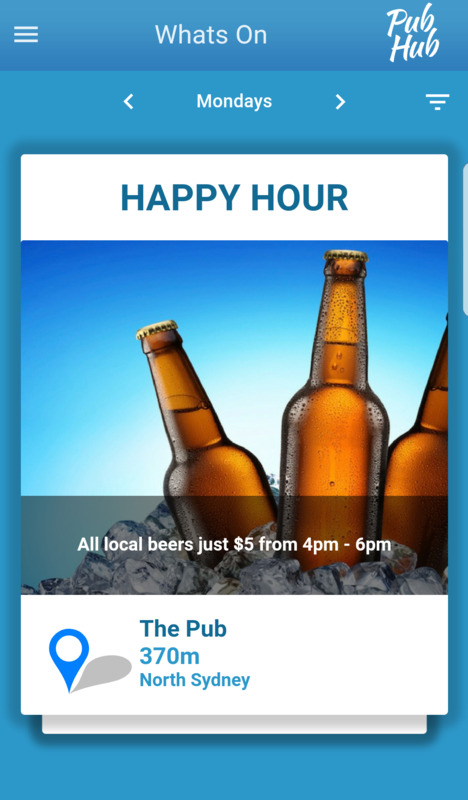 If you’re looking for a cheap steak or happy hour, or maybe you’re keen for some pub trivia or a meat raffle – PubHub gives you all the information you need with a few quick taps and swipes on the app. Can’t remember that awesome venue you found? Or keen to build a list of the best offers and events at all your locals? Save them straight into your favourites for quick access in the future. Looking for the perfect place to go out with your mates? Find out everything you need to know about venues around Australia. Venue pages include photos, contact details, opening hours, venue descriptions and features lists. 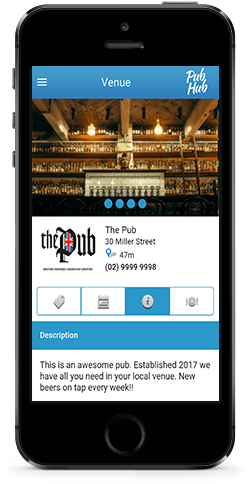 PubHub is a mobile application that connects pubs, clubs, bars and nightclubs with it customers. 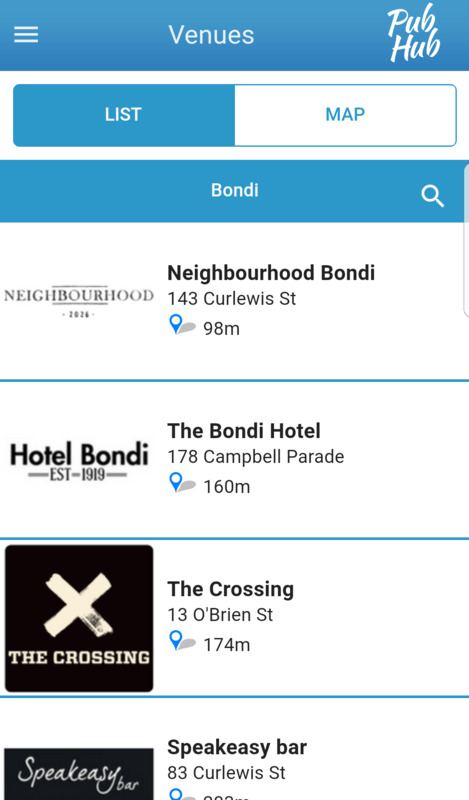 We strive to build the most modern and intuitive design, and make it as easy as possible for our users to find information on their favourite venues. 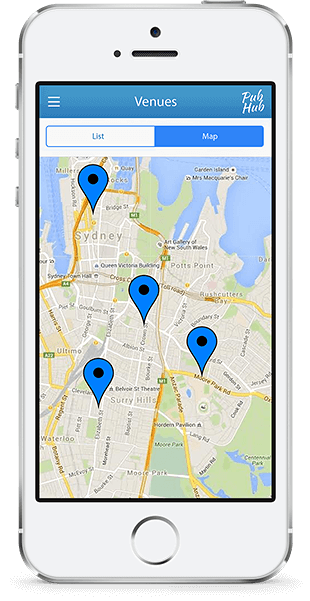 Go to the Cards area of the App for quick access to all the offers and events in your area. You can swipe up to move to the next card, swipe right to add the card to your saved list, or swipe left to let the app know you’re not interested (show less). PubHub will learn what you like over time! Based on how you interact with offers and events (i.e. save or show less) we’ll make sure we present the most relevant content to you in the future. 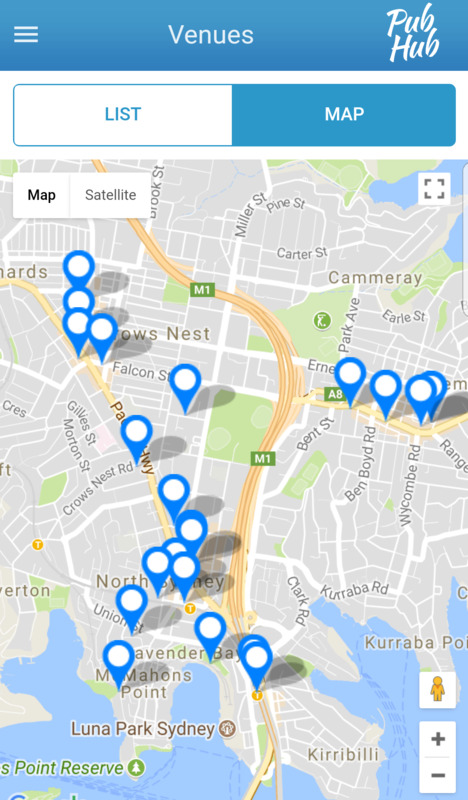 Keen to get to the pub quickly? You can click on the pin icon on the card and PubHub will open maps and taxi apps stored on your phone. 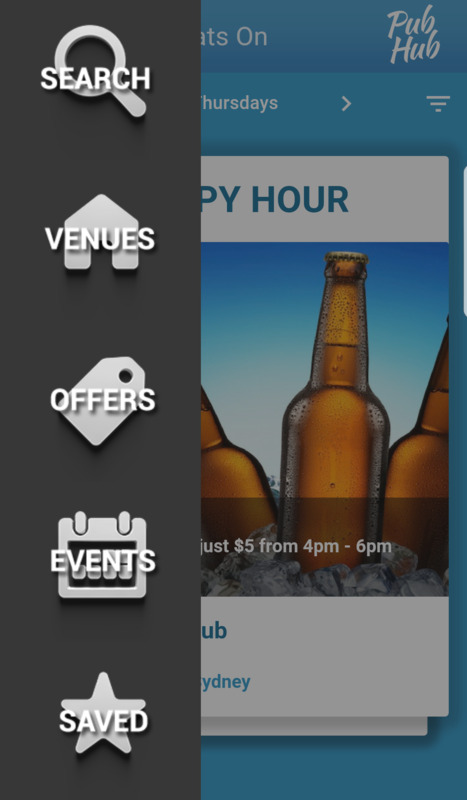 You can also click on the venue name to get detailed information including venue features, offers and events lists and menus. 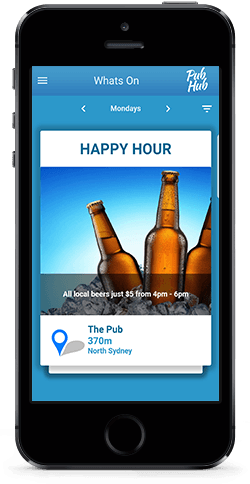 The PubHub mobile app is the most comprehensive source of information on pubs and clubs in Australia. Find the best venues, deals and events wherever you are, whenever you want. 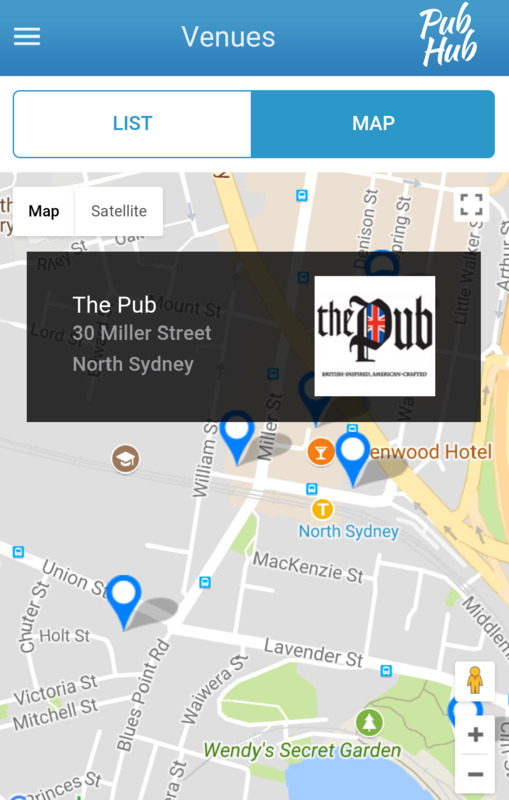 Search for venues by name, location, features and offerings or just browse for pubs close by on the interactive map. Looking for something to do? 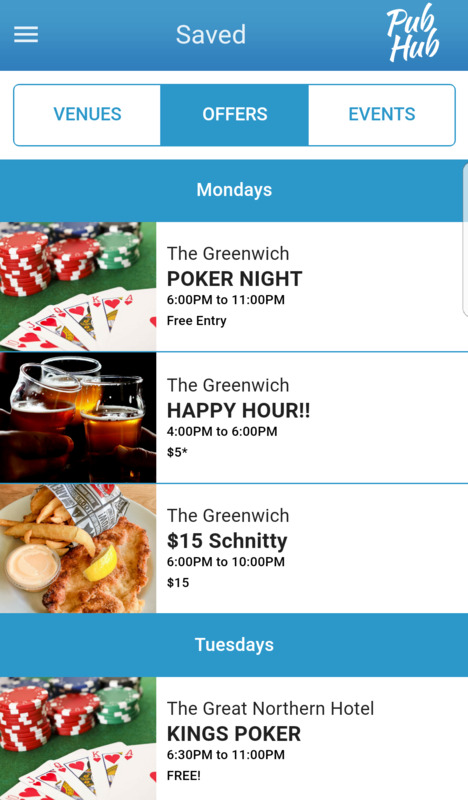 PubHub provides quick access to pub content including food and drink specials, happy hours, special events, trivia & poker nights. 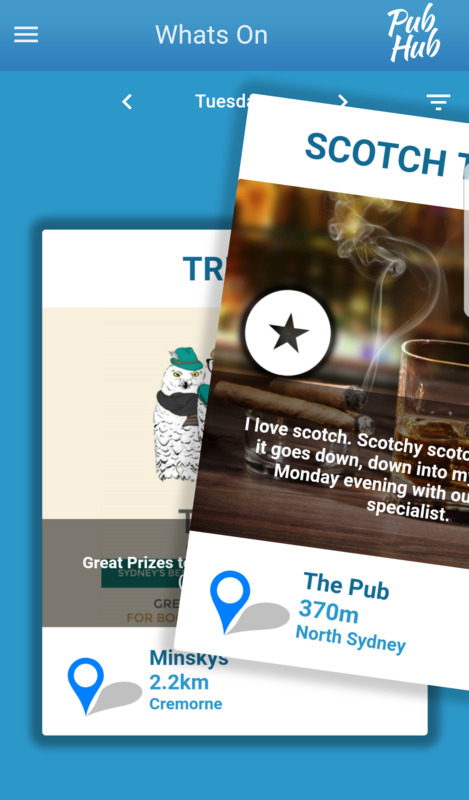 Our vision is to provide our USERS with the most comprehensive and useful pub app in the world. We strive to connect our VENUES with their customers by creating new and easy to use communication channels. Our EMPLOYEES are proud of the products and services we produce. We believe that pubs play an important role within local communities; a meeting place where social networks are strengthened and extended, as well as hosting a wide variety of community oriented events and activities that add considerably to local civic life. Click the icons below to follow us on social media. 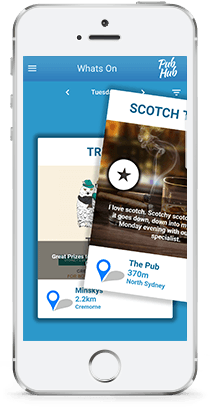 You can also signup for our newsletter – packed full of awesome offers and news about the app, as well as your local pubs bars and clubs! We keep your information private you so won’t end up with a bunch of Spam. Please read this End-User License Agreement ("Agreement") carefully before clicking the "I Agree" button, downloading or using PubHub ("Application"). This Agreement is a legal agreement between you (either an individual or a single entity) and PubHub Pty Ltd and it governs your use of the Application made available to you by PubHub Pty Ltd. The Application is licensed, not sold, to you by PubHub Pty Ltd for use strictly in accordance with the terms of this Agreement. 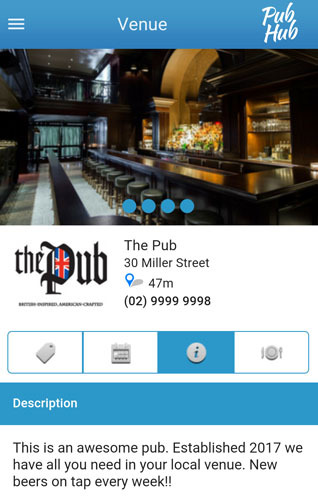 PubHub Pty Ltd grants you a revocable, non-exclusive, non-transferable, limited license to download, install and use the Application solely for your personal, non-commercial purposes strictly in accordance with the terms of this Agreement. • license, sell, rent, lease, assign, distribute, transmit, host, outsource, disclose or otherwise commercially exploit the Application or make the Application available to any third party. • copy or use the Application for any purpose other than as permitted under the above section 'License'. • modify, make derivative works of, disassemble, decrypt, reverse compile or reverse engineer any part of the Application. 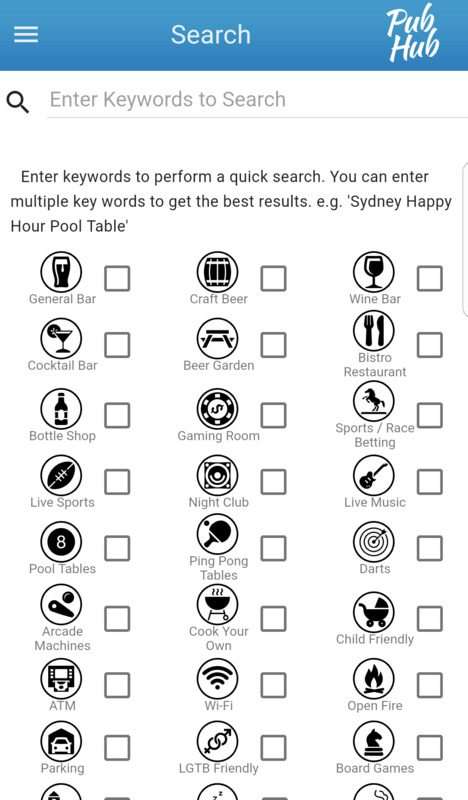 • remove, alter or obscure any proprietary notice (including any notice of copyright or trademark) of PubHub Pty Ltd or its affiliates, partners, suppliers or the licensors of the Application. The Application, including without limitation all copyrights, patents, trademarks, trade secrets and other intellectual property rights are, and shall remain, the sole and exclusive property of PubHub Pty Ltd.
Any feedback, comments, ideas, improvements or suggestions (collectively, "Suggestions") provided by you to PubHub Pty Ltd with respect to the Application shall remain the sole and exclusive property of PubHub Pty Ltd.
PubHub Pty Ltd shall be free to use, copy, modify, publish, or redistribute the Suggestions for any purpose and in any way without any credit or any compensation to you. 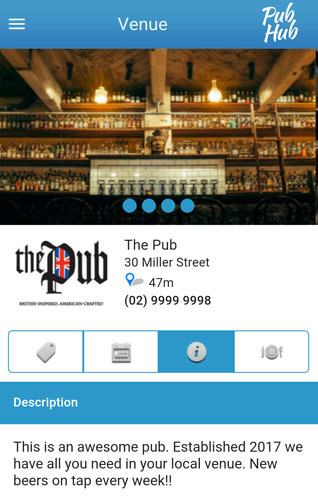 PubHub Pty Ltd reserves the right to modify, suspend or discontinue, temporarily or permanently, the Application or any service to which it connects, with or without notice and without liability to you. PubHub Pty Ltd may from time to time provide enhancements or improvements to the features/functionality of the Application, which may include patches, bug fixes, updates, upgrades and other modifications ("Updates"). Updates may modify or delete certain features and/or functionalities of the Application. You agree that PubHub Pty Ltd has no obligation to (i) provide any Updates, or (ii) continue to provide or enable any particular features and/or functionalities of the Application to you. You acknowledge and agree that PubHub Pty Ltd shall not be responsible for any Third-Party Services, including their accuracy, completeness, timeliness, validity, copyright compliance, legality, decency, quality or any other aspect thereof. PubHub Pty Ltd does not assume and shall not have any liability or responsibility to you or any other person or entity for any Third-Party Services. This Agreement shall remain in effect until terminated by you or PubHub Pty Ltd.
PubHub Pty Ltd may, in its sole discretion, at any time and for any or no reason, suspend or terminate this Agreement with or without prior notice. This Agreement will terminate immediately, without prior notice from PubHub Pty Ltd, in the event that you fail to comply with any provision of this Agreement. You may also terminate this Agreement by deleting the Application and all copies thereof from your mobile device or from your computer. Termination of this Agreement will not limit any of PubHub Pty Ltd's rights or remedies at law or in equity in case of breach by you (during the term of this Agreement) of any of your obligations under the present Agreement. You agree to indemnify and hold PubHub Pty Ltd and its parents, subsidiaries, affiliates, officers, employees, agents, partners and licensors (if any) harmless from any claim or demand, including reasonable attorneys' fees, due to or arising out of your: (a) use of the Application; (b) violation of this Agreement or any law or regulation; or (c) violation of any right of a third party. The Application is provided to you "AS IS" and "AS AVAILABLE" and with all faults and defects without warranty of any kind. To the maximum extent permitted under applicable law, PubHub Pty Ltd, on its own behalf and on behalf of its affiliates and its and their respective licensors and service providers, expressly disclaims all warranties, whether express, implied, statutory or otherwise, with respect to the Application, including all implied warranties of merchantability, fitness for a particular purpose, title and non-infringement, and warranties that may arise out of course of dealing, course of performance, usage or trade practice. Without limitation to the foregoing, PubHub Pty Ltd provides no warranty or undertaking, and makes no representation of any kind that the Application will meet your requirements, achieve any intended results, be compatible or work with any other software, applications, systems or services, operate without interruption, meet any performance or reliability standards or be error free or that any errors or defects can or will be corrected. Without limiting the foregoing, neither PubHub Pty Ltd nor any PubHub Pty Ltd's provider makes any representation or warranty of any kind, express or implied: (i) as to the operation or availability of the Application, or the information, content, and materials or products included thereon; (ii) that the Application will be uninterrupted or error-free; (iii) as to the accuracy, reliability, or currency of any information or content provided through the Application; or (iv) that the Application, its servers, the content, or e-mails sent from or on behalf of PubHub Pty Ltd are free of viruses, scripts, trojan horses, worms, malware, timebombs or other harmful components. Notwithstanding any damages that you might incur, the entire liability of PubHub Pty Ltd and any of its suppliers under any provision of this Agreement and your exclusive remedy for all of the foregoing shall be limited to the amount actually paid by you for the Application. To the maximum extent permitted by applicable law, in no event shall PubHub Pty Ltd or its suppliers be liable for any special, incidental, indirect, or consequential damages whatsoever (including, but not limited to, damages for loss of profits, for loss of data or other information, for business interruption, for personal injury, for loss of privacy arising out of or in any way related to the use of or inability to use the Application, third-party software and/or third-party hardware used with the Application, or otherwise in connection with any provision of this Agreement), even if PubHub Pty Ltd or any supplier has been advised of the possibility of such damages and even if the remedy fails of its essential purpose. Some states/jurisdictions do not allow the exclusion or limitation of incidental or consequential damages, so the above limitation or exclusion may not apply to you. PubHub Pty Ltd reserves the right, at its sole discretion, to modify or replace this Agreement at any time. If a revision is material we will provide at least 30 days' notice prior to any new terms taking effect. What constitutes a material change will be determined at our sole discretion. The laws of New South Wales, Australia, excluding its conflicts of law rules, shall govern this Agreement and your use of the Application. Your use of the Application may also be subject to other local, state, national, or international laws. If you have any questions about this Agreement, please contact us via email at info@pubhub.com.au. The Agreement constitutes the entire agreement between you and PubHub Pty Ltd regarding your use of the Application and supersedes all prior and contemporaneous written or oral agreements between you and PubHub Pty Ltd.
You may be subject to additional terms and conditions that apply when you use or purchase other PubHub Pty Ltd's services, which PubHub Pty Ltd will provide to you at the time of such use or purchase. http://www.pubhub.com.au is an online services site. 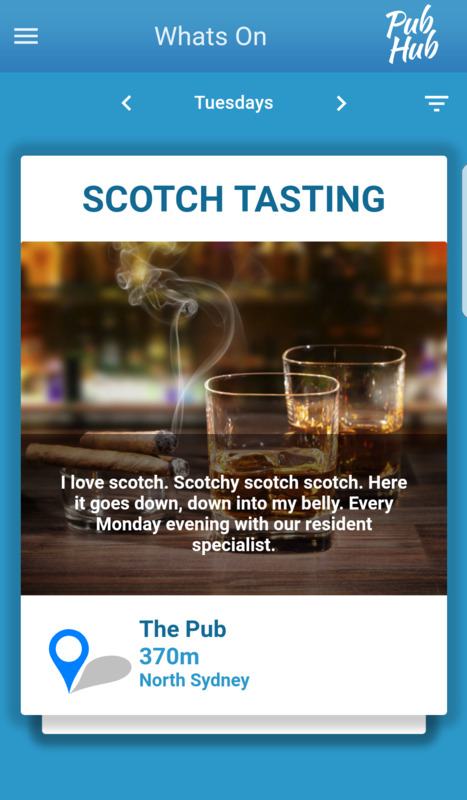 The Site provides access for PubHub customers and users to create an account, and upload or generate content to be displayed on the PubHub Mobile application. The website will provide detailed information on PubHub's services. Visiting http://www.pubhub.com.au or sending emails to PubHub constitutes electronic communications. You consent to receive electronic communications and you agree that all agreements, notices, disclosures and other communications that we provide to you electronically, via email and on the Site, satisfy any legal requirement that such communications be in writing. If you use this site, you are responsible for maintaining the confidentiality of your account and password and for restricting access to your computer, and you agree to accept responsibility for all activities that occur under your account or password. You may not assign or otherwise transfer your account to any other person or entity. You acknowledge that PubHub is not responsible for third party access to your account that results from theft or misappropriation of your account. PubHub and its associates reserve the right to refuse or cancel service, terminate accounts, or remove or edit content in our sole discretion. PubHub does not knowingly collect, either online or offline, personal information from persons under the age of thirteen. You may only use the site if you are aged 18 or over. • You can cancel your subscription or revert to a ‘free account’ from your account profile page. • The only valid method for canceling your Plan is via the cancellation link provided on your user "dashboard" page, accessible after logging in to the PubHub Venues Portal. Requests to cancel by e-mail or phone are not considered, and do not accomplish, cancellation. • Once you cancel your membership subscription, you will not lose access immediately. • Subscription fees are non-refundable; except that you may cancel renewed subscription by contacting PubHub within two (2) calendar days after renewal date and receive a full refund of the new subscription fees. http://www.pubhub.com.au may contain links to other websites ("Linked Sites"). The Linked Sites are not under the control of PubHub and PubHub is not responsible for the contents of any Linked Site, including without limitation any link contained in a Linked Site, or any changes or updates to a Linked Site. PubHub is providing these links to you only as a convenience, and the inclusion of any link does not imply endorsement by PubHub of the site or any association with its operators. Certain services made available via http://www.pubhub.com.au are delivered by third party sites and organizations. By using any product, service or functionality originating from the http://www.pubhub.com.au domain, you hereby acknowledge and consent that PubHub may share such information and data with any third party with whom PubHub has a contractual relationship to provide the requested product, service or functionality on behalf of http://www.pubhub.com.au users and customers. All content included as part of the Service, such as text, graphics, logos, images, as well as the compilation thereof, and any software used on the Site, is the property of PubHub or its suppliers and protected by copyright and other laws that protect intellectual property and proprietary rights. You agree to observe and abide by all copyright and other proprietary notices, legends or other restrictions contained in any such content and will not make any changes thereto. You will not use (or attempt to use) data mining, robots, screen scraping or similar data gathering and extraction tools. You will not modify, publish, transmit, reverse engineer, participate in the transfer or sale, create derivative works, or in any way exploit any of the content, in whole or in part, found on the Site. PubHub content is not for resale. Your use of the Site does not entitle you to make any unauthorized use of any protected content, and in particular you will not delete or alter any proprietary rights or attribution notices in any content. You will use protected content solely for your personal use, and will make no other use of the content without the express written permission of PubHub and the copyright owner. You agree that you do not acquire any ownership rights in any protected content. We do not grant you any licenses, express or implied, to the intellectual property of PubHub or our licensors except as expressly authorized by these Terms. PubHub has no obligation to monitor the Communication Services. However, PubHub reserves the right to review materials posted to a Communication Service and to remove any materials in its sole discretion. PubHub reserves the right to terminate your access to any or all of the Communication Services at any time without notice for any reason whatsoever. PubHub reserves the right at all times to disclose any information as necessary to satisfy any applicable law, regulation, legal process or governmental request, or to edit, refuse to post or to remove any information or materials, in whole or in part, in PubHub's sole discretion. Always use caution when giving out any personally identifying information about yourself in any Communication Service. PubHub does not control or endorse the content, messages or information found in any Communication Service and, therefore, PubHub specifically disclaims any liability with regard to the Communication Services and any actions resulting from your participation in any Communication Service. Venue Managers and employees are not authorized PubHub spokespersons, and their views do not necessarily reflect those of PubHub. PubHub does not claim ownership of the materials you provide to http://www.pubhub.com.au (including feedback and suggestions) or post, upload, input or submit to any PubHub Site or our associated services (collectively "Submissions" or “Content”). However, by posting, uploading, inputting, providing or submitting your Submission you are granting PubHub, our affiliated companies and necessary sublicensees permission to use your Submission in connection with the operation of their Internet businesses including, without limitation, the rights to: copy, distribute, transmit, publicly display, publicly perform, reproduce, edit, translate and reformat your Submission; and to publish your name in connection with your Submission. No compensation will be paid with respect to the use of your Submission, as provided herein. PubHub is under no obligation to post or use any Submission you may provide and may remove any Submission at any time in PubHub's sole discretion. All of Your Content is to comply with all regulatory guidelines and statutes within Australia. Your Content must not describe or promote any activity or event that would be considered to be in breach of Australian Law – specifically advertising guidelines related to Responsible Service of Alcohol (click here for further information) or Responsible Service of Gaming (click here for further information). We may use Your Content in a number of different ways, including displaying it publicly, reformatting it, incorporating it into advertisements and other works, promoting it, distributing it, and allowing our partners to do the same in connection with their own media platforms ("Other Media"). As such, you hereby irrevocably grant us world-wide, perpetual, non-exclusive, royalty-free, assignable, sub licensable, transferable rights to use Your Content for any purpose. Please note that you also irrevocably grant the users of the Site and any Other Media the right to access Your Content in connection with their use of the Site and any Other Media. Finally, you irrevocably waive, and cause to be waived, against PubHub and its users any claims and assertions of moral rights or attribution with respect to Your Content. By "use" we mean use, copy, publicly perform and display, reproduce, distribute, modify, translate, remove, analyze, commercialize, and prepare derivative works of Your Content. You will be able to connect your PubHub account to third party accounts. By connecting your PubHub account to your third party account, you acknowledge and agree that you are consenting to the continuous release of information about you to others (in accordance with your privacy settings on those third party sites). If you do not want information about you to be shared in this manner, do not use this feature. 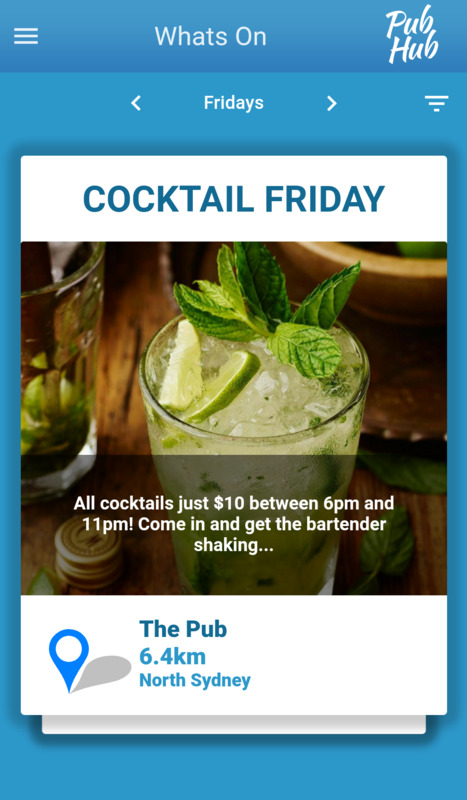 PubHub and its licensees may publicly display advertisements and other information adjacent to or included with Your Content. You are not entitled to any compensation for such advertisements. The manner, mode and extent of such advertising are subject to change without specific notice to you. 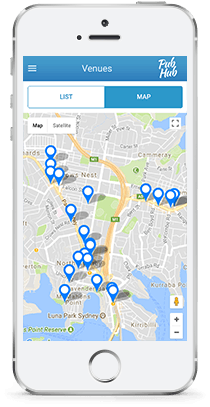 The Service is controlled, operated and administered by PubHub from our offices within the Australia. If you access the Service from a location outside Australia, you are responsible for compliance with all local laws. You agree that you will not use the PubHub Content accessed through http://www.pubhub.com.au in any country or in any manner prohibited by any applicable laws, restrictions or regulations. You agree to indemnify, defend and hold harmless PubHub, its officers, directors, employees, agents and third parties, for any losses, costs, liabilities and expenses (including reasonable attorney's fees) relating to or arising out of your use of or inability to use the Site or services, any user postings made by you, your violation of any terms of this Agreement or your violation of any rights of a third party, or your violation of any applicable laws, rules or regulations. PubHub reserves the right, at its own cost, to assume the exclusive defense and control of any matter otherwise subject to indemnification by you, in which event you will fully cooperate with PubHub in asserting any available defenses. THE INFORMATION, SOFTWARE, PRODUCTS, AND SERVICES INCLUDED IN OR AVAILABLE THROUGH THE SITE MAY INCLUDE INACCURACIES OR TYPOGRAPHICAL ERRORS. CHANGES ARE PERIODICALLY ADDED TO THE INFORMATION HEREIN. PUBHUB PTY LTD AND/OR ITS SUPPLIERS MAY MAKE IMPROVEMENTS AND/OR CHANGES IN THE SITE AT ANY TIME. PUBHUB PTY LTD AND/OR ITS SUPPLIERS MAKE NO REPRESENTATIONS ABOUT THE SUITABILITY, RELIABILITY, AVAILABILITY, TIMELINESS, AND ACCURACY OF THE INFORMATION, SOFTWARE, PRODUCTS, SERVICES AND RELATED GRAPHICS CONTAINED ON THE SITE FOR ANY PURPOSE. TO THE MAXIMUM EXTENT PERMITTED BY APPLICABLE LAW, ALL SUCH INFORMATION, SOFTWARE, PRODUCTS, SERVICES AND RELATED GRAPHICS ARE PROVIDED "AS IS" WITHOUT WARRANTY OR CONDITION OF ANY KIND. PUBHUB PTY LTD AND/OR ITS SUPPLIERS HEREBY DISCLAIM ALL WARRANTIES AND CONDITIONS WITH REGARD TO THIS INFORMATION, SOFTWARE, PRODUCTS, SERVICES AND RELATED GRAPHICS, INCLUDING ALL IMPLIED WARRANTIES OR CONDITIONS OF MERCHANTABILITY, FITNESS FOR A PARTICULAR PURPOSE, TITLE AND NON-INFRINGEMENT. PubHub reserves the right, in its sole discretion, to terminate your access to the Site and the related services or any portion thereof at any time, without notice. To the maximum extent permitted by law, this agreement is governed by the laws of the State of California and you hereby consent to the exclusive jurisdiction and venue of courts in California in all disputes arising out of or relating to the use of the Site. Use of the Site is unauthorized in any jurisdiction that does not give effect to all provisions of these Terms, including, without limitation, this section. You agree that no joint venture, partnership, employment, or agency relationship exists between you and PubHub as a result of this agreement or use of the Site. PubHub's performance of this agreement is subject to existing laws and legal process, and nothing contained in this agreement is in derogation of PubHub's right to comply with governmental, court and law enforcement requests or requirements relating to your use of the Site or information provided to or gathered by PubHub with respect to such use. If any part of this agreement is determined to be invalid or unenforceable pursuant to applicable law including, but not limited to, the warranty disclaimers and liability limitations set forth above, then the invalid or unenforceable provision will be deemed superseded by a valid, enforceable provision that most closely matches the intent of the original provision and the remainder of the agreement shall continue in effect. Unless otherwise specified herein, this agreement constitutes the entire agreement between the user and PubHub with respect to the Site and it supersedes all prior or contemporaneous communications and proposals, whether electronic, oral or written, between the user and PubHub with respect to the Site. A printed version of this agreement and of any notice given in electronic form shall be admissible in judicial or administrative proceedings based upon or relating to this agreement to the same extent and subject to the same conditions as other business documents and records originally generated and maintained in printed form. It is the express wish to the parties that this agreement and all related documents be written in English. PubHub reserves the right, in its sole discretion, to change the Terms under which http://www.pubhub.com.au is offered. The most current version of the Terms will supersede all previous versions. PubHub encourages you to periodically review the Terms to stay informed of our updates. The most current version of these Terms will always be available online on the PubHub website http://www.pubhub.com.au/. You understand and agree that your access to or use of the Site is governed by the Terms effective at the time of your access to or use of the Site. If we make significant changes to these Terms, we will notify you by email or by posting a notice on the Site prior to the effective date of the changes. We will also indicate at the top of this page the date that revisions were last made. You should revisit these Terms on a regular basis as revised versions will be binding on you. Any such modification will be effective upon our posting of new Terms. You understand and agree that your continued access to or use of the Site after the effective date of adjustments to the Terms indicates your acceptance of the adjustments. When ordering, or registering on our site, as appropriate, you may be asked to enter your name, email address, mailing address, phone number, credit card information, demographic information or other details to help you with your experience. We collect information from you when you register on our site, place an order, subscribe to a newsletter, open a Support Ticket, enter information on our site or provide us with feedback on our products or services. • To improve our website and applications, in order to better serve you. If you turn cookies off, some features will be disabled. It won't affect the user's experience that make your site experience more efficient and may not function properly. However, you will still be able to place orders. If at any-time you would like to unsubscribe from receiving future emails, simply follow the instructions at the bottom of each email and we will promptly remove you from ALL correspondence. 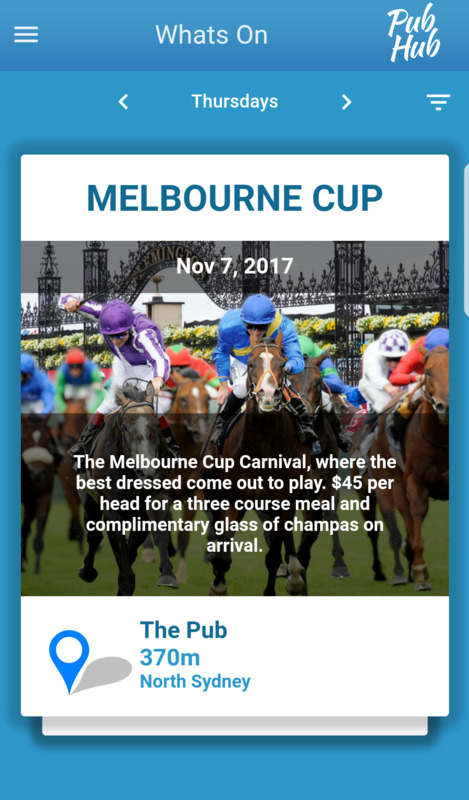 The information contained on http://pubhub.com.au website and mobile app (the "Service") is for general information purposes only. PubHub Pty Ltd assumes no responsibility for errors or omissions in the contents on the Service. In no event shall PubHub Pty Ltd be liable for any special, direct, indirect, consequential, or incidental damages or any damages whatsoever, whether in an action of contract, negligence or other tort, arising out of or in connection with the use of the Service or the contents of the Service. PubHub Pty Ltd reserves the right to make additions, deletions, or modification to the contents on the Service at any time without prior notice. PubHub Pty Ltd does not warrant that the website is free of viruses or other harmful components. Please note that the PubHub Pty Ltd does not guarantee the accuracy, relevance, timeliness, or completeness of any information on these external websites.